Also called Corn Plant because of its lush leaves. It has a strong trunk ending in a shock of leaves which are deep green with yellow stripes. 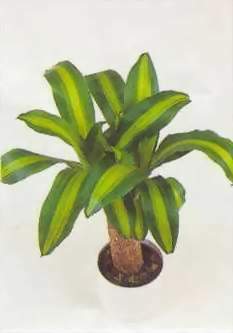 Young dracaena plants naturally have leaves located at the base of the plant, but as the plants mature, they lose their bottom leaves, thus giving the plant a palm-like appearance. Very fragrant flowers. The Dracaena species is increasingly popular because they are decorative and possess amazing powers of resistance. Use in offices and living rooms to purify air. They may be left undisturbed for years on end. Full sun to part shade, avoid heavy frosts. They are almost impossible to kill. The only danger is of drowning when the plant is set in a plastic pot indoors. Dracaenas do not mind being potbound, but they can be repotted in spring. Does well with little light or artificial light. Indoor plant care: Prefers a warm atmosphere of between 16 - 20 degrees Celsius. Needs good drainage. Moderate humidity is adequate. Grow in a standard potting mix. Wash leaves monthly with soft room temperature water and remove withered leaves. Do not use leaf shiners. Indoors watch for aphids, mealy bugs and scale. Take outdoors for a week, remove them by hand, or spray with white oil.